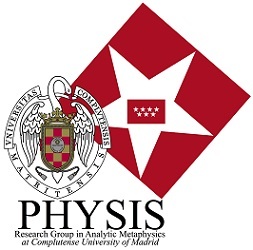 The PHYSIS Research Group at Complutense University of Madrid invite you to attend the PHYSIS Lectures in Analytic Metaphysics 2019 to be given by Peter Forrest (University of New England) on the topic of the metaphysics of combinatorial possibility. The distinction between the conceivable and the possible is familiar, and Kripke’s examples of a posteriori necessary truths, such as water being H2O, have convinced many that they do not coincide. The Two Dimensional theory. (e.g. Davies and Humberstone, ‘Two notions of necessity’, Chalmers, ‘Epistemic two-dimensional semantics’.) of possibility will be discussed, but I shall argue that examples show that this does not exhaust the distinction. I conclude that the case for necessary synthetic truths is strong but the idea of metaphysical possibility obscure. I examine George Bealer’s treatment of concepts and universals. I show how a theory of universals can provide an account both of conceivability and possibility. David Armstrong’s combinatorial fictionalism about possibilities, and David Lewis’ combinatorial epistemology for his modal realism will be presented. Fictionalism avoids the problem of alien possibilities, including ones that are inconceivable. The problem is that (1) there are ‘impoverished’ possible worlds in which some of the actual world’s properties, such as electric charge, have no instances, so (2) in those worlds these would be alien properties. It seems that our world may be likewise impoverished relative to other worlds. But once we allow there are alien properties there seems no limit to them, which violates Ockham’s Razor. In response, the case for realism about modalities needs to be re-assessed. Armstrong’s selective realism about universals will be given a qualified endorsement and used to provide a realist theory of possibilities as structural universals. This inherits the problem of alien possibilities, under the guise of alien universals. There is the additional problem of giving a theory of structural universals. Some strategies for solving these problems will be outlined, notably the thesis that all structure supervenes on spatio-temporal structure. The case for this thesis depends on the interpretation of contemporary physics and is therefore somewhat speculative. Mathematical truths are metaphysically necessary. Various realist theories of mathematics will be assessed in the light of the previous lectures, resulting in a theory of higher-order universals. A case will be made against the principle that the necessary is necessarily necessary. The Axiom of Choice is a plausible counter-example.